June 26th--Gary had to work all weekend, so all the girls went out to visit family. We stayed with my mom and Dale. My Uncle Allan had a 50th birthday party. We all had a good time. Maria enjoyed meeting Elizabeth's gerbil and swimming in the pool. June 27th--My brother Danny had his highschool graduation party! He is leaving for the Marines within a couple of weeks. Another busy holiday! We went to church at WP Baptist. We went out to dinner with Gary's Dad and Brooke and Marsha's Mom and Dale. Then we visited Grandpa & Grandma Gordon. Then we visited Marsha's Dad and Shirley. Finally we traveled home! June 17th--We were able to celebrate Gary's birthday! Poor Gary rode his motorcycle to work and the ride home was not fun. He came home in the pouring rain and he was freezing by the time he walked in the door. I think it took his whole party to get warm. It was Maria's first family birthday party! What fun! Today was Maria's last day of therapy at Ithaca College. She made dirt pudding with worms and other gummy candies. Kirstie helped her out. They had a great time. 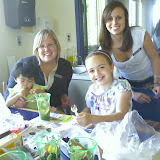 See the picture below of Kirstie and Maria with 2 great IC speech therapists! Marsha took Maria to the ENT for an ear cleaning and a look at her middle ear. It was an adventure to say the least! The doctor called an extra helper in the help hold Maria down. After holding her down and listening to her scream for awhile the doctor finally determined that Maria would have to be put under an anesthetic for the procedure. This meant that we had to cancel Maria's upcoming audiologist appointment, as it was contingent upon today's exam. Since the Dr. was unable to look in her ears he decided to schedule Maria for a surgery. He will clean out her ears and possibly insert tubes on July 7th. June 11th--Marsha's externship ends at Cayuga Medical. It was a very adventurous day, as she locked the keys in the car. The security guy drove her around to get a "tool" and then drove to her car. By this time it was pouring. The guy was determined to get the car unlocked and continued to get drenched. Marsha sat in the car talking to Gary and telling him that he most likely had better come pick her up! Finally the security guy gave up and drove Marsha back to the hospital front door. It made for some entertainment while waiting for Gary to pick her up. June 13th to June 16th--Babysit our friends' kids. All the kids had a great time. Macella is finishing up 7th grade. She finishes up with tests on the 19th. Kirstie is having a lot more fun at the end of the year. She has a field trip, spelling bee, play, bowling, SPCA visit, Tye dye day, career day, field days, and finally a 1/2 day on the 25th. Somehow I don't remember the end of 4th grade being so much fun! Both girls have been able to have friends over and have had a fun beginning of summer already! June 6th--Meet with AWAA support group in Rochester. We presented a PowerPoint presentation about our adoption of Maria and our China trip. It was a small group, but so nice to introduce Maria to our friends of the past three years. They have been with us through all of our waiting. We have watched many of them bring their children home and continue to pray for those still awaiting their children.